Ch 33.This chair is made from a variety of timbers. It stands about 5 feet (1500mm). The timbers are Rose gum and Huon Pine. Red Cedar and Sassafras make up some highlights. The leather is slightly padded over a solid timber seat. The back is laced to the frame. It is 3.5mm veg. tanned and hand coloured using spirit dyes. 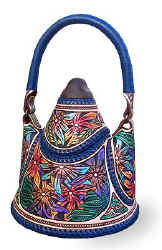 The tips of the leather leaves and flowers are coloured with mica to create an iridescent appearance. Ch 32.This chair is made from a variety of woods. It stands about 5 feet (1500mm). The timbers are Rose gum, Red Cedar and Sassafras. The leather is free slung and will take the shape of the human body after many sittings . It is 3.5mm veg. tanned and hand coloured using spirit dyes. The tips of the leather leaves are coloured with mica to create an iridescent appearance. L2. This light is made from Blackwood with a King Billy pine base. It stands about 1800mm (6 feet) tall and 120mm dia. (about 5 inches). The lampshade is 600mm long with numerous slots and holes the for the light to escape from. it has two fluorescent globes. It is 3.5mm veg. tanned and hand coloured using spirit dyes. 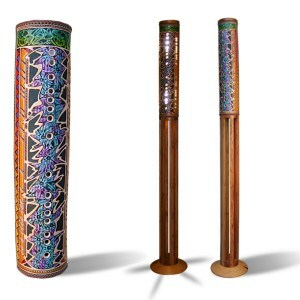 The tips of the leather pattern are coloured with mica to create an iridescent appearance. Misc 12. 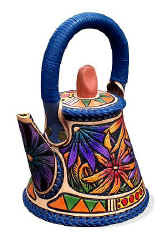 This is an ornamental teapot. It's about 12 inches (300mm) high from top to bottom. The wooden knobs, spout and handle are myrtle and the leather is 3.5mm veg. tanned and hand coloured using spirit dyes. The tips of the leather flowers are coloured with mica to create an iridescent appearance. Ch 29.This chair is made from a variety of woods. It stands about 5 feet (1500mm). The timbers are blackwood, , Sassafras, Red Cedar and Huon pine. The leather is molded to fit the round seat. It is 3.5mm veg. tanned and hand coloured using spirit dyes. The tips of the leather leaves are coloured with mica to create an iridescent appearance. 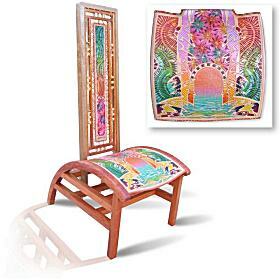 Ch 28.This chair is made from a variety of woods. It stands about 5 feet (1500mm). The timbers are blackwood, myrtle, Tasmanian Oak, Red Cedar and Huon pine. The leather is molded to fit the round seat. It is 3.5mm veg. tanned and hand coloured using spirit dyes. The tips of the leather flowers are coloured with mica to create an iridescent appearance. Bowl 8. This bowl is made from two pieces of 3.5mm veg. tanned leather, wet moulded and glued together. 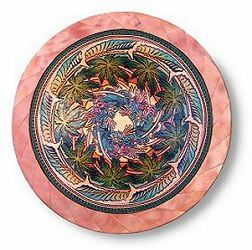 It is joined at the edges with a circle of Tasmanian Myrtle, made up from twenty four laminated pieces. The timber is finished with natural oils . 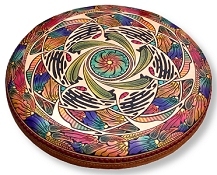 Both sides are hand carved and coloured using spirit dyes. The leather edges are finished using kangaroo leather lacing. 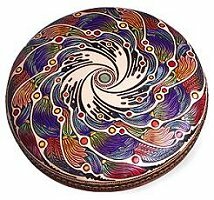 It is 18" (450mm) diameter and stands 4" (100mm) tall. Bowl 7. This bowl is made from two pieces of 3.5mm veg. tanned leather, wet moulded and glued together. 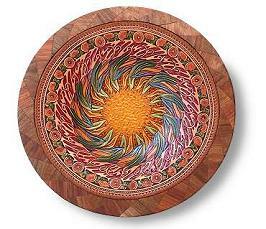 It is joined at the edges with a circle of Tasmanian Blackwood, made up from twenty four laminated pieces. The timber is finished with natural oils . 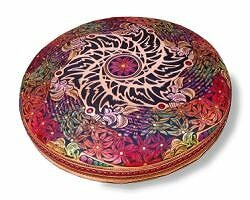 Both sides are hand carved and coloured using spirit dyes. The leather edges are finished using kangaroo leather lacing. 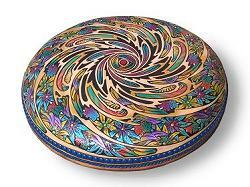 It is 18" (450mm) diameter and stands 4" (100mm) tall. Bowl 6. This bowl is made from two pieces of 3.5mm veg. tanned leather, wet moulded and glued together. 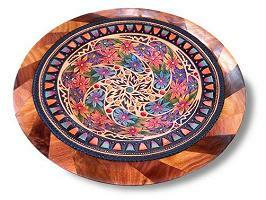 It is joined at the edges with a circle of Tasmanian Blackwood, made up from twenty four laminated pieces. The timber is finished with natural oils . 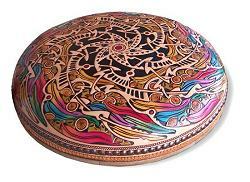 Both sides are hand carved and coloured using spirit dyes. The leather edges are finished using kangaroo leather lacing. 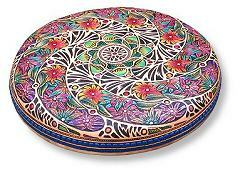 It is 18" (450mm) diameter and stands 4" (100mm) tall. 1Cl 1. This clock stands about 350mm (14 inches) tall. It is made predominately of Blackwood. The face is Myrtle as well as the surrounds of the base. 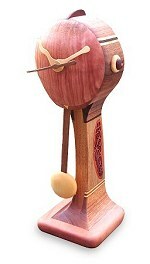 The hands and the disc on the pendulum are of huon pine. There are also highlights of huon pine and red cedar. Small inserts of carved and coloured leather are on either side of the stem . Ch 26.This chair is made from a variety of woods. It stands about 5 feet (1500mm). The timbers are blackwood, myrtle, swamp gum and huon pine. The leather is molded to fit the round seat. It is 3.5mm veg. tanned and hand coloured using spirit dyes. The tips of the leather flowers are coloured with mica to create an iridescent appearance. Ch 25.This chair is made from a variety of woods. It stands about 5 feet (1500mm). The timbers are blackwood, myrtle, swamp gum and huon pine. The leather is molded to fit the round seat. It is 3.5mm veg. tanned and hand coloured using spirit dyes. The tips of the leather flowers are coloured with mica to create an iridescent appearance. 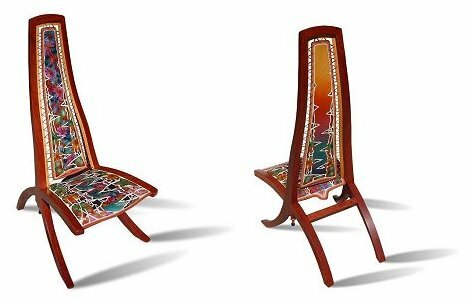 Ch 24.This chair is made from a variety of woods. It stands about 5 feet (1500mm). The timbers are myrtle, blackwood, sassafras and huon pine. The leather is molded to fit the round seat. It is 3.5mm veg. tanned and hand coloured using spirit dyes. The tips of the leather leaves are coloured with mica to create an iridescent appearance. Bag 63. 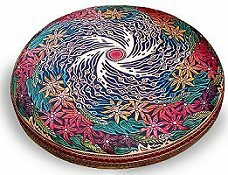 This bag is 13" (280mm) high (to the top of the handle) with a circular bottom 8" dia (200mm). It has a separate leather lid with a wooden sassafras knob hand made to suit the curved contour. Inside the lid is a blackwood centre which aligns it to the base. The handle is covered with kangaroo leather lacing. The leather is 3.5mm veg. tanned and hand coloured using spirit dyes. The tips of the leather flowers are coloured with mica to create an iridescent appearance. It is lined with pale beige pigskin. Ch 23.This chair is made from a variety of woods. It stands about 5 feet (1500mm). The timbers are myrtle, blackwood, sassafras and huon pine. The leather is molded to fit the round seat. It is 3.5mm veg. tanned and hand coloured using spirit dyes. The tips of the leather flowers are coloured with mica to create an iridescent appearance. Bag 58. 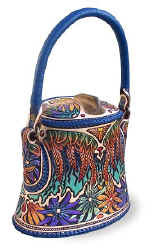 This bag is 11" (280mm) high (to the top of the handle) with an oval bottom 7"x4" (180mmx100mm). It has a leather hinged lid with a wooden myrtle knob hand made to suit the curved contour. The handle is covered with kangaroo leather lacing. The leather is 3.5mm veg. tanned and hand coloured using spirit dyes. The tips of the leather flowers are coloured with mica to create an iridescent appearance. It is lined with pale beige pigskin. 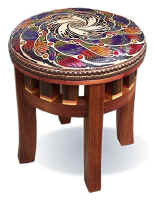 ch 22.This stool is made from a variety of woods. It stands about 400mm tall and 350mm dia. 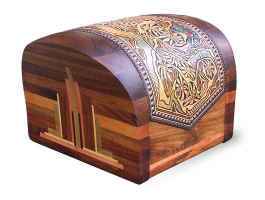 The main timber is Tasmanian blackwood, with highlights of myrtle, sassafras and huon pine. The leather is molded to fit the round seat. It is 3.5mm veg. tanned and hand coloured using spirit dyes. Ch 19.This chair is made from a variety of woods. It stands about 5 feet (1500mm). The timbers are blackwood, myrtle, sassafras and huon pine. The leather is molded to fit the round seat. It is 3.5mm veg. tanned and hand coloured using spirit dyes. The tips of the leather flowers are coloured with mica to create an iridescent appearance. Bag 56. 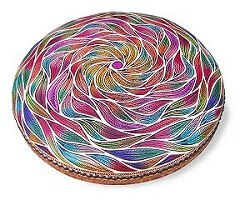 This bag is 11" (280mm) high (to the top of the handle) with an oval bottom 7"x4" (180mmx100mm). It has a leather hinged lid with a wooden sassafras knob hand made to suit the curved contour. The handle is covered with kangaroo leather lacing. The leather is 3.5mm veg. tanned and hand coloured using spirit dyes. The tips of the leather flowers are coloured with mica to create an iridescent appearance. It is lined with pale beige pigskin. footstool 9. The timber in this footstool is predominantly laminated Tasmanian blackwood. The inlays in either end contain myrtle, sassafras and huon pine. It stands about 340mm tall and 350mm wide and deep. The leather is 3.5mm veg. tanned and hand coloured using spirit dyes. Map 2. 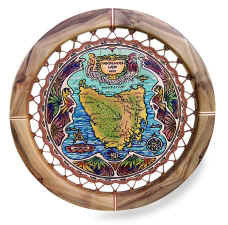 This map of Tasmania is stretched onto a wooden frame made from sassafras with myrtle and huon pine highlights. The leather map is laced to the frame with kangaroo leather lacing. Small leather triangles are inserted into the frame to receive the lacing. It is 20" (500mm) in diameter. The leather is 3.5mm veg. tanned and hand coloured using spirit dyes. Misc 11. 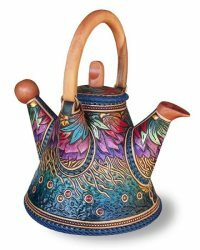 This is an ornamental teapot. It's about 7 inches (180mm) high from top to bottom. The wooden knob is myrtle and the leather is 3.5mm veg. tanned and hand coloured using spirit dyes. The tips of the leather flowers are coloured with mica to create an iridescent appearance. Pf 12. This picture frame holder is designed to display a 6" x 4" (150mm x 100mm) photo. 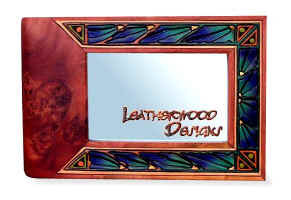 The wood used in the frame is Myrtle and the leather is 3.5mm veg. tanned and hand coloured using spirit dyes. Bowl 4. This bowl is made from two pieces of 3.5mm veg. tanned leather wet moulded and glued together. It is joined at the edges with 3mm kangaroo leather lacing. Both sides are hand coloured using spirit dyes.